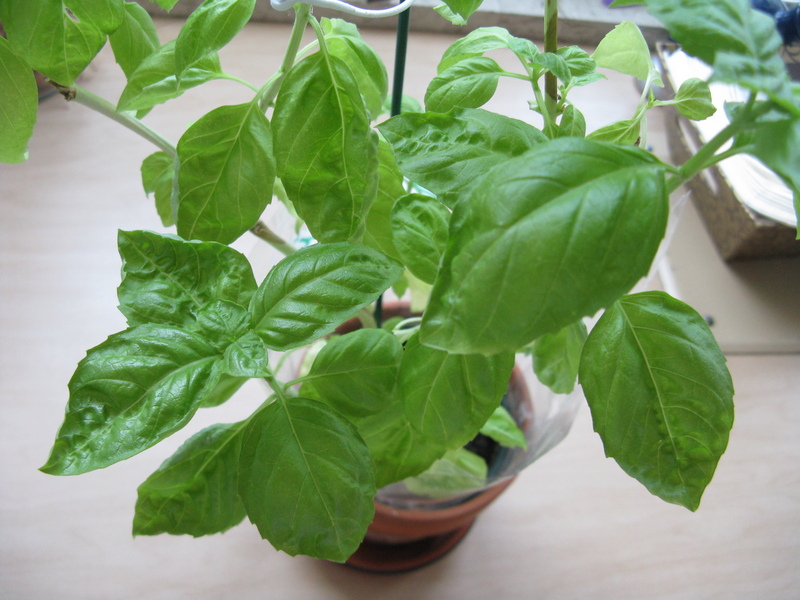 Summer is in full swing, and the basil plant that I acquired a month ago has been reminding me of its bright and refreshing flavor with its bountiful jewel-green leaves. Ever since I got this plant, I’ve been in love with fresh basil. I tear up a leaf or two and sprinkle it on top of my rice when I eat my meals, and it adds a hint of fresh flavor that reminds me of eating at a Thai restaurant. When I water my basil, the smell of the leaves always reminds me of delicious appetizer skewers of cherry tomatoes with balls of mozzarella and basil leaves, all drizzled with the most luscious balsamic vinegar. And one of these days, I am going to harvest a big handful of basil to make the freshest, most flavorful pesto sauce, mmm. Last week when my boyfriend was in town visiting for the July 4th long weekend, we were discussing options for a night of cooking in when I remembered a recipe for goat cheese tarts with sweet onions and thyme that I saw on the Serious Eats French in a Flash column. They sounded like the perfect appetizers to go with a pasta dinner that we were planning. I was particularly excited about the goat cheese, as I had just recently bought a small pyramid of spreadable Chavrie (goat’s milk cheese) and had not thought of a good way to use it yet. And instead of thyme, the thought of the bright taste of fresh basil paired with this tart made my mouth water. The original recipe also calls for using frozen puff pastry for the tart bases, but I had some frozen phyllo dough that I’ve been wanting to use instead, which I thought would add a dimension of lightness to the appetizer as well. My inspiration for adding honey to the tarts came from the multiple experiences I have had with restaurant appetizers that wonderfully pair the salty creaminess of cheese with the sweetness of fruit and honey, such as with baked brie and sheep’s milk ricotta. So thus was born the concept of crispy flaky squares of phyllo dough topped with soft caramelized onions, basil, goat cheese, and a drizzle of honey to bring all the flavors together. In execution, this recipe is actually pretty straight-forward. But do plan ahead, as it takes about an hour to make these tarts, although most of the time is spent waiting, with some stirring here and there, so it is definitely an appetizer that is great to make alongside your main dish and it will be piping hot and ready to serve just when you are finishing up your cooking. If you have never used phyllo dough before, fear not! This recipe was my first time using my frozen phyllo dough as well, and although the directions on the box sounded scary and involved, the actual preparation of the dough was very easy. It would help immensely if you have a pastry brush to brush the phyllo layers with oil, but if you are a poor student like me, the back side of a big soup spoon will do just fine too :) These tarts were so good hot out of the oven, even my boyfriend who doesn’t like cheese enjoyed these. 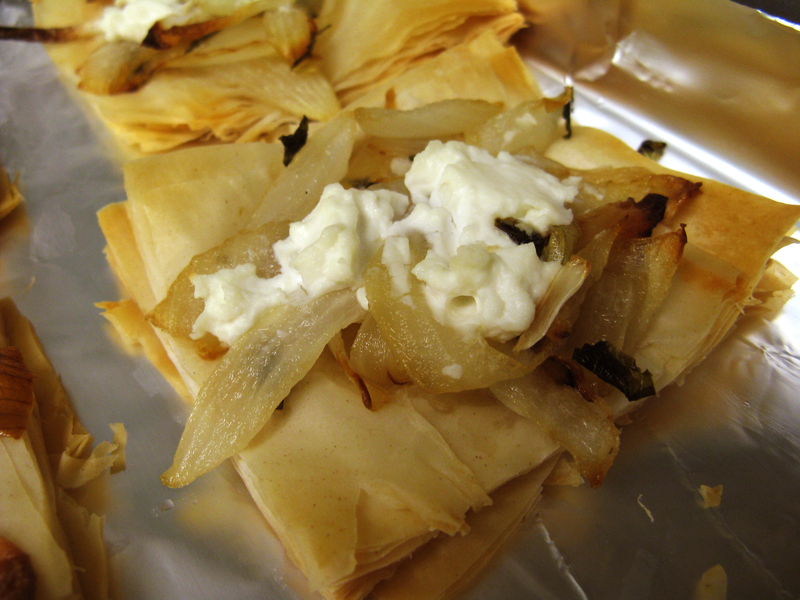 The flavors come together to be savory, the textures of the soft cheese and onions contrast with the crisp phyllo dough, and the hint of richness from the goat cheese is balanced by the brightness of the basil and the touch of honey. I will be keeping this recipe for the future when I want to serve French hors d’oeuvres at a dinner party, and I hope you’ll enjoy them as much as I do! 1. In a skillet on medium heat, gently saute onions with 1/2 tbsp of grape seed oil, stirring often, for 15 minutes. 2. Tear up the leaves from 1 sprig of basil (about 10 leaves) and add to skillet along with brown sugar. Stir to mix well, and continue to cook for an additional 10 minutes. Turn down the heat slightly if the onions are browning too quickly. 3. Remove onions from heat and set aside. Preheat oven to 350 degrees F.
4. Prepare thawed phyllo dough on a clean cutting board. Layer one sheet of phyllo on top of the next, brushing each layer with a light coating of grape seed oil (it does not need to coat entire sheet, but do brush enough to ensure that each sheet adheres to the next. When all 20 sheets have been layered together, use a sharp chef’s knife and cut into approximately 6 squares. 5. 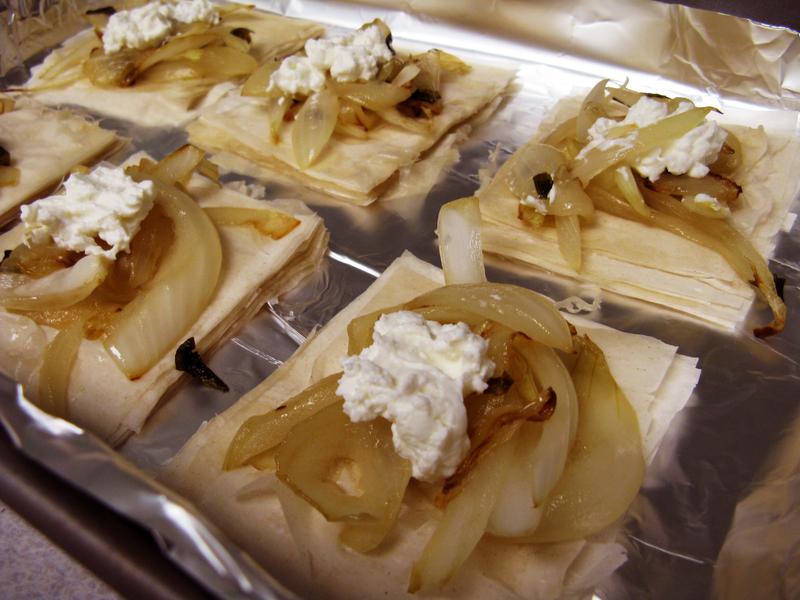 Line a baking pan with foil, and spread phyllo dough squares into pan. Top each square with onions, then the goat cheese. 6. Bake for 25 minutes at 350 degrees F until the phyllo bakes to a golden color. 7. Remove tarts and serve warm, drizzled with honey and garnished with torn fresh basil. Enjoy! This entry was posted on Friday, July 9th, 2010 at 8:57 pm	and posted in appetizers, baking, cheese, cooking, French, herbs and spices, recipes. You can follow any responses to this entry through the RSS 2.0 feed. Yum! Both of these look amazing. Especially the pasta..I wonder how it would work with shrimp in place of the chicken? I was searching for delicious recipes that call for onions to post along side my jingle entry on vidaliaonion.org., so that people can enjoy the many uses for the sweet onions grown in Vidalia, Georgia. 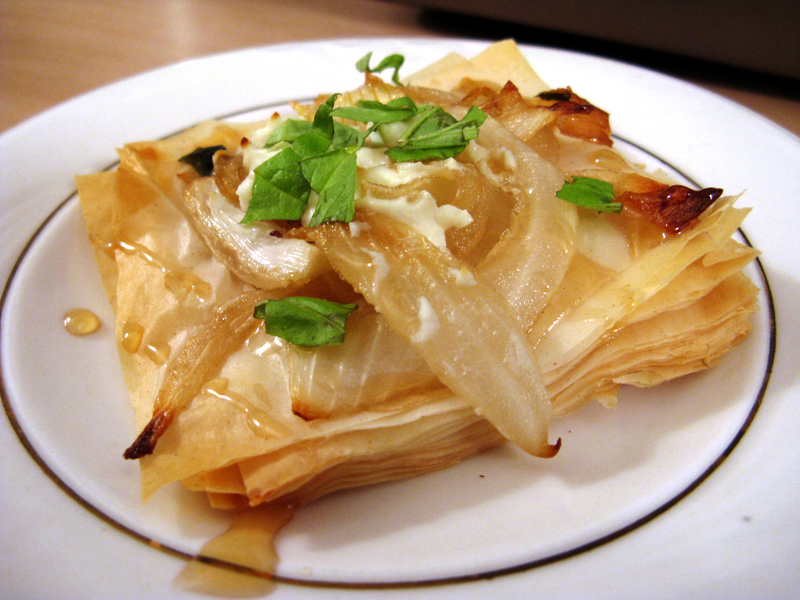 Your “Caramelized onion and goat cheese phyllo tarts with fresh basil” look so yummy!!! 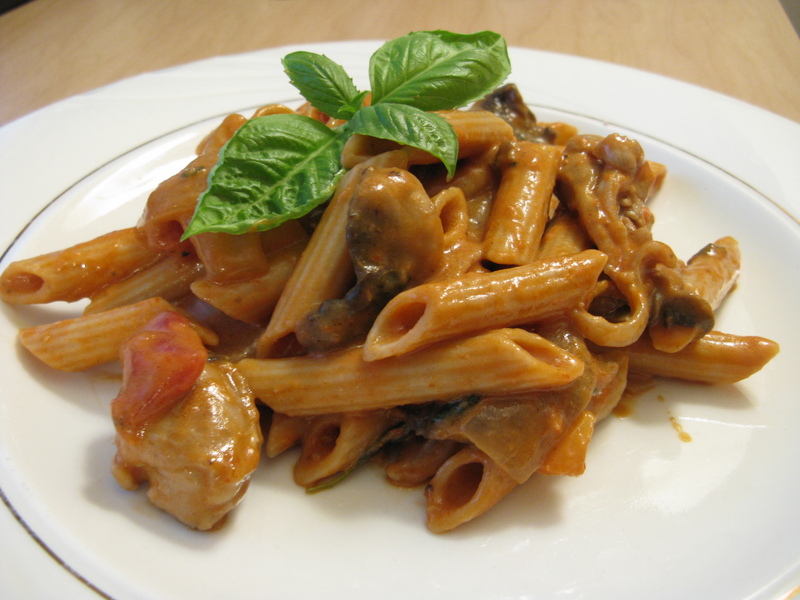 I posted this recipe to Your credit, Lucy, with insertion (adaptation) of “Vidalia” onion. Thank You for sharing Your truly beautiful and enjoyable blog, “My Edible Memories”!